Are you at your prime? Nowadays, it is very rare that I build Gundams straight out of the box with no additional modifications. 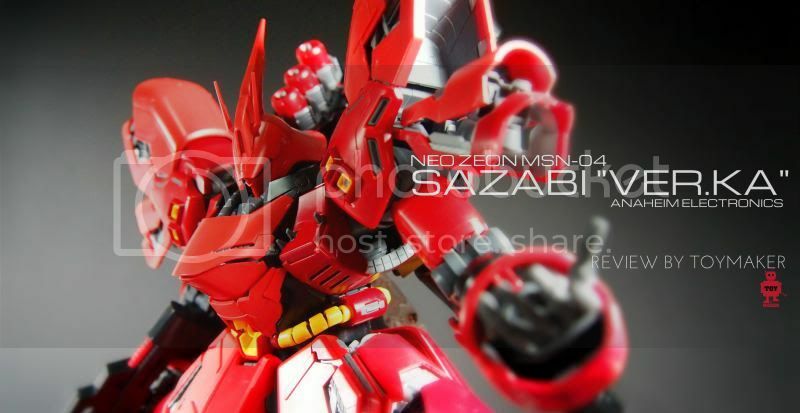 Most of the time, I would be using materials like pla-plates and other metal components to detail up my kits. So it is essential that I prime my models. 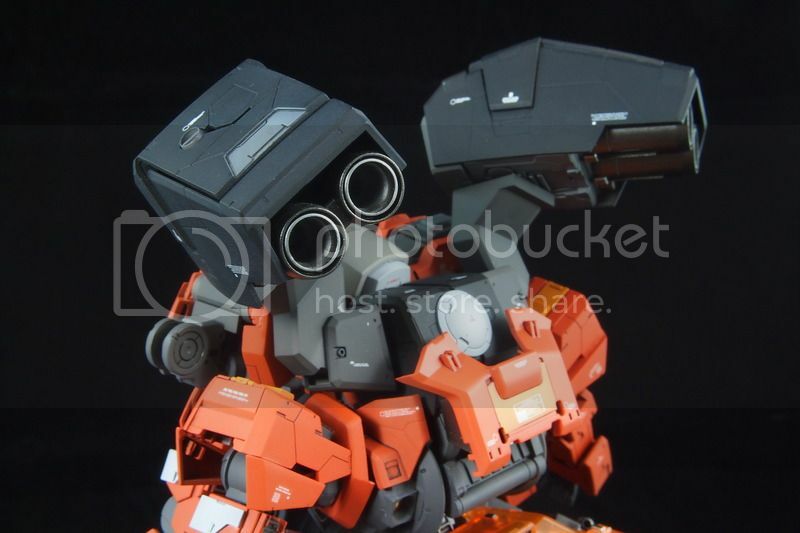 I prime all the parts including the internals and "those that cannot be seen after snapping on the armors". It's just a preference on my part. With this I can also achieve evenness of the paint job later. Always hold the primer away from the model, depress as you approach the model, one direction, left to right. Several light coats to prevent flooding the details. Rotate the model when priming to ensure even coverage. Distance from the part to spray is about 20-30 cm. Too far, you will have a coarse surface and too near, you will "drench" your part. The primer actually shrinks as it cures, protecting the details. And at this stage, certain mistakes become more visible. So it good to stop, sand and repair and re-prime again. Repeat the process until you are satisfied with the final product. Primers has a curing period of at least 24 hours, so no painting is recommended. Remember this is a make or break stage, so it is better to check the primed model many times before painting. 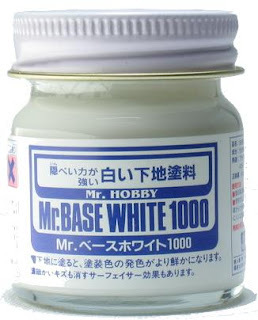 For primers, I use Mr Hobby white and grey primers. They come in aerosol cans or in bottles for airbrushing. I prefer using can sprays as it cut down precious time although coverage could be a issue for some. I use white primers only when I want my final coat to be bright for example the base coat of the Sinanju I did recently was white. Most of the time, most of the kits, I would be using grey primers. Mr Hobby Mr Base White 1000 - This will give you a pretty thick coat and hence you need some control otherwise excess primer will accumulate at the recesses of the parts. So apply several layers of thin coats with even rotation should do the trick. 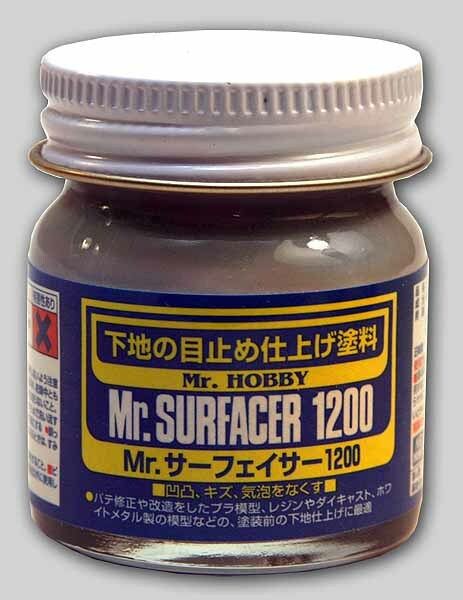 Mr Hobby Mr Surfacer 1200 and 1000 - 1200 is of course finer but less easy to apply for me. I tend to use up a lot of primers in one outing. I used up 8 cans for my Sinanju. It is a bit extravagant. I guess I got carried away. But for those who are cost conscious, you can try those bottled primers made for airbrushes. You need to use thinner to thin it before application. It is less costly but I find it a chore to use airbrush and cleaning it later. And you have to clean throughly or you risk damaging your AB permanently. However, one advantage is that it gives you control than spray cans so you don't "flood" your details and can achieve even coverage. "Hey, I notice that you said you stick your spray paint in "hot water". IMO thats not really ideal. Spray cans contain an enormous amount of pressures. Sticking you cans in "hot" boiling water may cause the can to rupture. (aka explode in your face) I know most cans nowadays comes with pressure release "fail-safe mechanics" build into the spray nozzle themselfs before "that" happens but its not something I would personally bet my face/life on. I'm pretty sure you dont use boiling hot water to warm your cans but you might wanna change "hot" to something like "luke-warm" for those people that don't understand the difference. My usually advice is to not use water so hot that it causes pain when you touch it. (should be comfortable)"
There also be some goodies to be given for those who pre-order on the day of the event. Each person is entitled to the one set irregardless of how many orders he or she makes. Gifts are sponsored by HAG and Hobby Mate. For every order of two HGs, a goodies bag worth $30.00 of products and 1 movie ticket coupon will be given. For every order of one MG, a goodies bag worth $70.00 of products and 1 movie ticket coupon will be given. Latest Update : Bandai will be offering 30 points (Club Gunpla) for any one pre-order of the RG RX-78. Why kids don't listen? You and I was one. And we all know better :) Looking back, I realized I was quite a brat. Running away from home, getting into fights and a lot of other "naughty" stuff. I guess we get our thrills by doing all these. Back then, we do not understand there are rules to follow and consequences to bear. But what I did not realized was my actions hurt the people we love most, our parents. As a parent now, I am beginning to understand how my parents felt, in particularly how my MUM felt. I felt that she was always suffering in silence all the while. If only I was more understanding and caring. At least I can brighten her day a bit. More than 18,000 attendees joined in the fun with SHINE Youth Mascot Parade 2009 (SYMP). 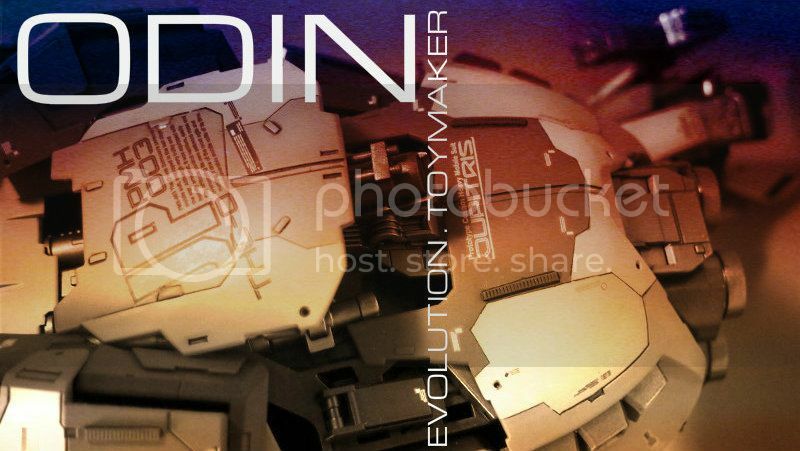 Showcasing Iconic Characters, Superheroes, Master-Villains across Movies, Games, Anime and Youth Culture, the success of SYMP provides the foundation for the creation of COSMO 2010 – which adds exclusive showcases under the brand. COSMO 2010, the umbrella brand by Mascot Parade Limited, is the annual Orchard Youth Costume initiative. Youths are encouraged to participate and challenge themselves in this national initiative. 2010 COSMO Logo design centers around a mix of two basic colours, Deep Pink and Bright Blue - the contrast represent the iconic representations of youth insights, interests and passion for their hobbies, combined into one special event. Indeed, COSMO is all set to support the growth of emerging youth trends as the ultimate annual youth event! The 4 Segments of SHINE Youth Mascot Parade represents emerging youth trends that are found in Singapore & Asia. The vivid colours of Orange and Blue in our 2009 logo symbolises youth fiery passion and cool determination towards a mega parade event for youth in Asia. Computer Games and Electronic Entertainment ranks as one of the top leisure youth activities in Singapore. Expect well known gaming characters like : StarWarsDarth Vader, Super Mario Bros, Harry Potter and other cool franchises will be invited to be part of the Gaming Segment. In addition, Youth CosPlayers can also participate in the parade dressed up as their favorite gaming and manga/comic characters. Youth and the Arts defines the local Youth Culture. Be innovative and create unique costumes from recycled materials. Or showcase your musical talents by participating as part of the Parade musical bands, leading each segments of the parade as we proceed with the parade march in the heart of town. 1 degree of change can save the world and youth can drive the message for environmental awareness through the parade. Increase awareness for the environment by dresssing up in costumes made of recycled materials! Iconic characters like : the Water Wally, Andes Mosquito, and other such as an anti-smoking mascot will be invited to be part of the Environment Segment. In addition, Youth and organisational representatives can play a role and share on projects to save theenvironment. But what I am more interested is that this time Hobby Art Gallery will be taking part in the event as a strategic partner. 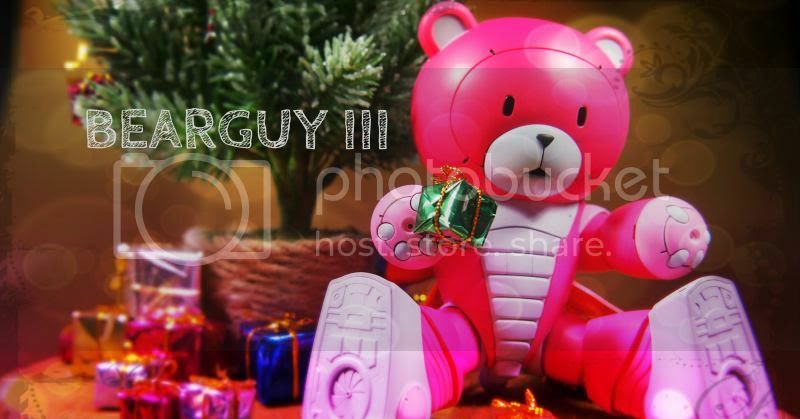 The main aim of their participation is to promote Gunpla here and garner interest among the young folks about this hobby. 4. Got a problem you can't solve and questions about modeling? Well, there will be a "Information" counter set up just for this. So bring down the Gundam kit that you may have a problem, the staff will try their best to advice you. Further details to be released. See you guys on 3 July! I will be there for sure. 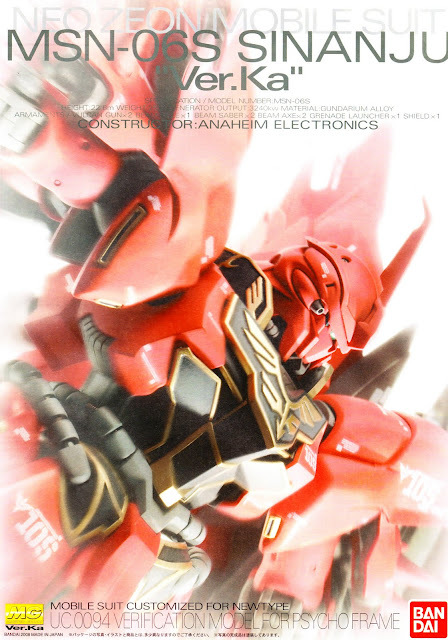 Master Grade & SD Gundam Model Kit Challenge 2010 is currently held at Takashimaya, basement 2. This year the entries seem to be lesser compared to previous years. However , there is an improvement in the overall standard in particularly the presentation. People are paying more attention to this aspect now. Before I go on, I want to take this opportunity to thank the organizers for a good job done on the display units. Not only are they spacious and well-lit, it offers a 360 degrees view of the entries. OK, here you go... some random pictures I took.